The EMC5042 is a complete linear charger for two-cell lithium-ion batteries. 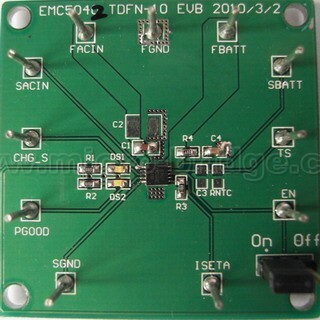 With small TDFN-10 package and few external components, EMC5042 is well suited for portable applications. No external sense resistor and blocking diode are required. Charging current can be programmed externally with a single resistor. The built-in thermal regulation facilitates charging with maximum power without risk of overheating. The EMC5042 always preconditions the battery with 1/10 of the programmed charge current at the beginning of a charge cycle, after it verifies that the battery can be fast-charged. 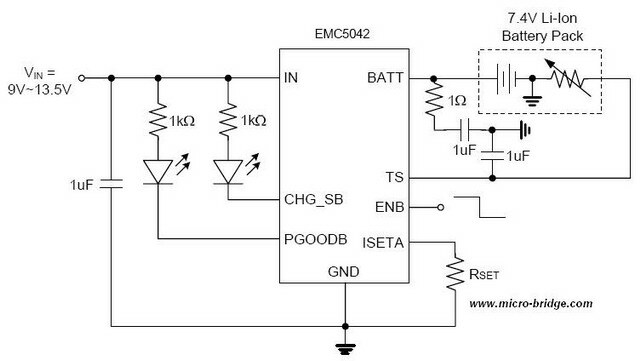 The EMC5042 automatically terminates the charge cycle when the charge current drops to 1/10th the programmed value after the final float voltage is reached. The EMC5042 features 13.5V maximum rating voltage for AC adapter, and it provides the charge current up to 1.2A. Other features include battery temperature monitoring, reverse current protection, shutdown mode, charging current monitor, under voltage lockout, automatic recharge and status indicator.